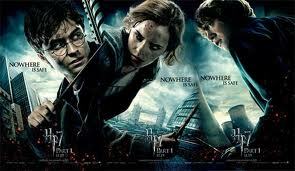 The good news: the movie is well worth the money and wasn’t messed up as say, the 6th installment of the franchise. The first applause should be given to the wonderful use of special effects in this movie: the scene where the professors at Hogwarts were protecting the castle from Voldemort’s forces was very impressive, with the glowing, almost electric dome encasing the castle and the armed clay and steel statues coming to life under Professor McGonagall’s spell. Equally remarkable was the trio’s escape from Gringotts on the back of an albino dragon. The effects were seamlessly woven onto the film and it is almost believable that these things can happen in real life, until of course, you exit the cinema and real life takes over. Special mention should also be given to the set of the movie, which carried me straight-on into the battle for Hogwarts. But the other, more sublime draw of the movie is how it makes a generous display of the rich acting talent that is so abundant in Britain (and makes you wonder why so many no talents in Hollywood are more famous than they are – the saying, shallow water makes much noise suddenly come to mind). We all know that Helena Bonham Carter is a very skilled actor and this movie franchise has probably brought her to the minds of more audience than all her past films – here, she shows her versatility in playing just about anything by playing the cruel and murderous Bellatrix Lestrange and having a very brief five minutes to play Hermione impersonating her. It was a hoot to see her acting exactly like Hermione, from the facial twitches, to the breathing, to the mannerisms. Professor Mcgonagall totally won me over in her two shining scenes when she admonished Filch by saying, “they’re supposed to be out of bed, you blithering idiot” (or something like that) and when she used the spell, Piertotum Locomotum and commented rather giddily, that “I’ve been wanting to use that spell my entire life.” Wasn’t it just too cute? And of course, everybody’s favourite ambiguous character, arguably the richest one in the books, Alan Rickman’s Processor Snape also gets his share of the limelight, and I shed a bucket of tears in the scene where he was attacked by Nagini and I could not help but sob out loud when he asked Harry to look at him as he dies, wanting to die looking up into the eyes that reminded him so much of the one woman he had loved: Lily, Harry’s mother. 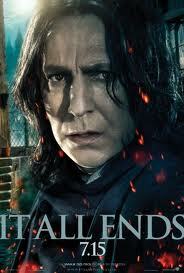 I could not help but feel though, that Snape should have had more scenes. As it is, his presence on screen was rather too short. Fiennes as Voldemort didn’t quite impress me as it did the others, though. He looked like a snake/cancer patient/clown and the only thingnotable about his acting was his raspy voice. Of the three main characters, I would still say that Ron has shown the most promise, acting-wise, followed closely by Hermione. Harry sometimes feel lost, or starts out great but then mumbles his way to the end. And I can’t help but be annoyed sometimes by his hand gestures when he speaks, although, looking back, these subtle traits of his made Harry very real, like an extension of Daniel Radcliffe. Now, while I wouldn’t dare pick on the story line, as it was as perfect as any fantasy story could be, there were some key scenes which were excluded from the movie, probably because their inclusion would have made the movie reach a part 3, but which were crucial at providing the necessary insights. 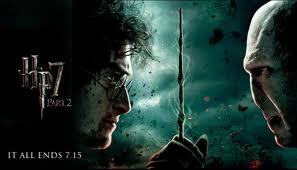 The movie assumes everyone watching has read and re-read the books before coming into the cinema but if you have not, or did not refresh your memory, you would be at a lost at who Aberforth Dumbledore is, or Ariana is, and what caused the irreparable rift between Albus Dumbledore and his brother. The duel scene between Mrs. Weasley and Bellatrix were too short, and felt like it was just added in to appease the loyal readers of the book. But if it was done to do just that, they should have just done away with it, altogether. There was also the omission of the Weasley’s reunion with Percy (although this is quite trivial). Certain liberties were also taken such as when it was Hermione who suggested breaking out of Gringott’s on the back of the dragon (it was Harry in the books), and how Harry broke the Elder Wand after defeating Voldemort. But perhaps the most glaring one is how Nagini was left crawling all over Hogwarts when it was supposed to be the last know Horcrux (Harry was of course, the 7th and last Horcrux that Voldemort was unaware he had made) and always stayed protected in an invisible cage or near Voldemort. The book, as all the others in the series with it, was a magnificent work of Rowling’s genius but some of its magnificence didn’t quite translate to the big screen or got lost somewhere in Yate’s direction. The movie wasn’t as grand as it could have, and thus deprived the beloved characters the grand finale they should have had. It was good, but it never quite reached the epic scale of say, the Lord of the Rings, and did not leave me with the feeling of wanting to relive the scenes over and over again. Will I watch it again? Yes. Undoubtedly. But because I am a Harry Potter fan and not because I genuinely loved the movie. *Photos grabbed from google images. I have to agree with you on its lacking in epic-ness. It's a good movie indeed, but somewhat lacking. the battle scene with harry and voldemort was kinda disappointing. i wish they had said their spells out loud too, so the audience would understand what had happened. yeah, was disappointed with the battle scenes, which was supposed to be the climax of the movie. the gringotts escape was better pa.